Charlotte Party Rentals White Resin Garden Chair is perfect for wedding ceremonies, garden parties and any other special occasion. These chairs are extremely stable, they hold up to 250 pounds per chair. 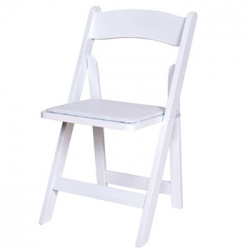 Comes with white padded seat for extra style and comfort.